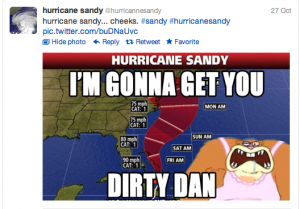 Once news broke that a hurricane would be headed toward the United States, attention-obsessed Twitter users quickly jumped on the idea of a spoof account. Many have been created, but the one that stuck out most to me was @HurricanneSandy. The Twitter user created this account on October 25 and has posted around 140 tweets. With nearly 164,000 followers, this spoof account has been very successful. 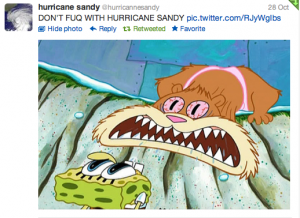 At first it was harmless humor like using Sandy Cheeks, from the television show “Spongebob,” as the hurricane’s mascot. They used picture memes of Sandy Cheeks on maps of where the hurricane would hit or pictures from “Spongebob” with jokes about the hurricane. This soon escalated to distasteful and offensive humor. Tweets using constant swear words or derogatory language covered the majority of their page. They started tweeting things like, “RETWEET IF YOU WANT ME TO DESTROY YOUR SCHOOL FOR YOU. I GOT YO BACK,” which I thought was unnecessary. Many people are affected by this hurricane and it is one thing to make light humor by assigning it a mascot but in my opinion it crosses the line when that person is joking about destroying schools and the East Coast in general. @HurricanneSandy never did redeem themselves. They continued to post the same jokes over and over again. I believe I saw the same jokes at least four or five times scrolling through their page. Shockingly, the pictures this twitter account posted were not as distasteful as I thought they were going to be. Their pictures were an example of light humor of the situation. They were not too offensive and even I laughed at a few of them. After this Twitter page gained as many followers as it did, a few celebrities followed them, one was Miley Cyrus. After Cyrus followed the page, the account user borderline stalked her and the rest of their posts up to the last one was directed toward her. The creator is attention obsessed and took this account too far. Not once did they send their condolences to the people affected by the hurricane like other Hurricane Sandy accounts did. They took a serious event and even though their humor was harmless at first, it quickly grew into something that was unnecessary and offensive.